As we move towards 2018 you might be taking a look at what you’re doing well at work and what you need to improve on. Quite often we can blame our lack of motivation or productivity on ourselves where in fact it could be an issue with our working environment that’s causing thee problem so in this article we look at 4 factors you need to consider to supercharge your office productivity in 2018. Don’t worry, creating a welcoming workspace doesn’t have to be a daunting task – it can be fun and exciting! You want to make sure that the space reflects who you are as a company, and what you have to offer, as well as being comfortable for both your employees and your clients. You need to walk the tightrope between professional and casual. You can use your office space to show who you are and what you stand for. For example, if you are a company that holds recycling in high regard, then your office can reflect that by using re-purposed furniture and implementing green methods of working. You also need to make sure that your design reflects you as a company and professional business person, and not you who goes surfing on the weekend and loves the beach life. When choosing your office in the first place – consider the noise levels within and around the building. If you have a building site next to you, no one is going to enjoy it, but it’s not something you can help, but you can help to muffle the noise with fabric drapes and large plants. Any noise within the building is something you can control; some people will be able to get on with their tasks in the middle of a busy open-plan office, where others might not. You can judge by your existing staff which would be better. If your staff want to listen to music at their desks then allow them to – but perhaps with headphones in (everyone’s music tastes are different) or have an office radio if everyone is happy with that idea. A messy office is not something you want to be showing to the world, either through your employees or when clients come. In fact, a dirty or messy office will reflect badly on your ability to do good and organised work, and so will give the worst impression. Hire a cleaner once a week, or more often if needed, to handle the usual office debris. But think about having the floors shampooed or buffed a couple of times a year too, as the constant tread of feet will dull it easily. Remember: First impressions count so if a customer walks in and sees peeling paint and scuffed walls they’re not going to be overly confident in your abilities. If you walk into a place and it’s freezing cold, you’re not going to want to stay in for long. The same if it’s sweltering hot. Your employees don’t get the choice of leaving, but they just might if the conditions are terrible. If you are in a typically drafty building, invest in space heaters, and if the building is a hot one – make sure you install air con. If you have large windows that catch a lot of sun, make sure that you have blinds that can diffuse the light, this will reduce the heat coming in to the office and reduce glare on worker’s monitors as well. Again remember that your staff are going to be at their desks 99% of their workday so you need to make sure they are comfortable. Good quality office furniture is easy to get and not too expensive. If you have a member of staff who you know has a back problem, then compensate for that and get them a well-supported chair – better yet, provide ergonomic workstation for all members of staff. It’s also worth thinking about the seating in the reception and any other space your clients will inhabit – you want them to be comfortable and welcome. Creating a great first impression before they’ve even stepped in to the meeting room will put them at ease and help your business dealings later on – give them uncomfortable furniture to sit on in the waiting area and you’ll immediately put them on edge. Employee and Client comfort is key to running a successful business. You don’t have to spend a huge amount of money; a few small tweaks can make the workplace environment better for everyone which will increase productivity and revenue. 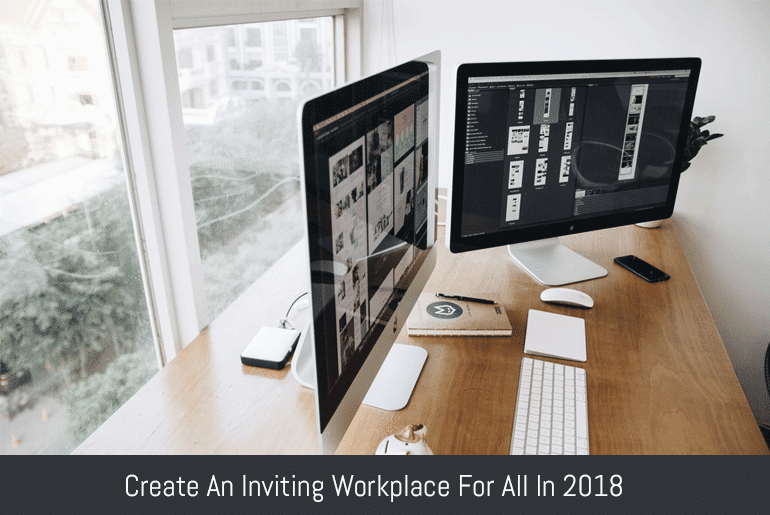 Take a look at your workspace: What minor change can you make in 2018 to make your workers more comfortable? Is it better chairs? A water fountain? Free soda? Ask them – you may be surprised how simple their request is and you’ll end up building a great rapport with them thanks to your generosity.